An invitation to LGBTI+ community, family, friends & carers, community and health service providers, practitioners, & businesses. Join us for two interactive (honest, respectful & fun) panels where those difficult questions can be asked. – LGBTI+ community, friends, family and carers, would you like to challenge service providers in why they don’t ask ‘those’ difficult questions? – Service providers, would you like to be more sensitive and inclusive in asking LGBTI+ community members about their needs? 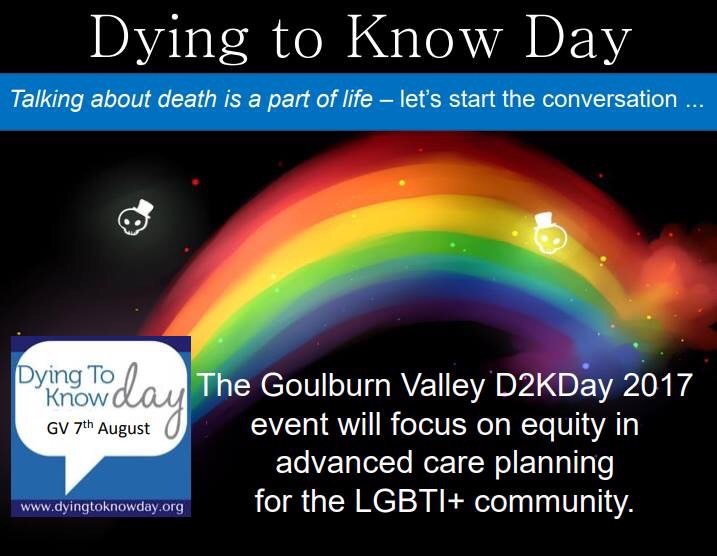 Please join us at the Dying to Know Day, “You can’t ask that” panel, have a conversation over coffee and cake, and pick up some resources.